Brush onto face with puff or foundation brush using light, sweeping motions. Blend well. How To Use: Brush onto face with puff or foundation brush using light, sweeping motions. Blend well. I have tried quite a few powders in my 16ish years wearing makeup and I am being 100% honest with you when I say that this powder is the best, smoothest, and best coverage I've ever had with a loose powder. 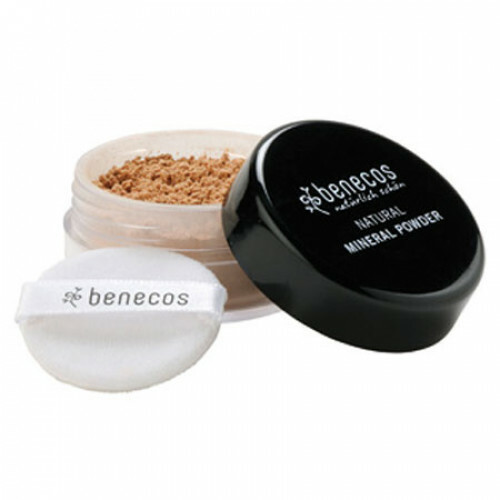 I've tried powders that are natural and a lot that aren't, and Benecos is just a high quality makeup that does what it is supposed to do without the added junk. I am a new consumer of all-natural makeup, so I was a bit skeptical placing my first order here on Love True Natural. But this product has completely won me over...this is absolutely the best powder I have ever used! It gives me a matte, beautiful face that lasts all day without ever getting shiny (and I do mean ALL DAY!). It performs very well in photographs too, it never looks chalky or cakey. My only gripe is that there is generally lots of fallout when applying it...be very careful if you're wearing something black and trying to touch up your face.